Preheat oven to 400 degrees with racks in upper and lower thirds. Soak potatoes in warm water 5 minutes; drain and dry thoroughly. Toss with oil and rosemary, season with salt and pepper, and spread on a rimmed baking sheet. Bake on top rack 20 minutes. Meanwhile, toast panko on another rimmed baking sheet on bottom rack until golden, about 5 minutes. Transfer to a wide dish. Place flour in another dish; season with salt and pepper. Whisk eggs in a third dish. Season fish with salt; coat in flour, then eggs, then panko. Transfer, narrow side down, to a parchment-lined baking sheet. Flip potatoes; transfer to lower rack. Place fish on upper rack; bake until fish is just cooked through and potatoes are crisp and golden brown in places, 16 to 18 minutes. 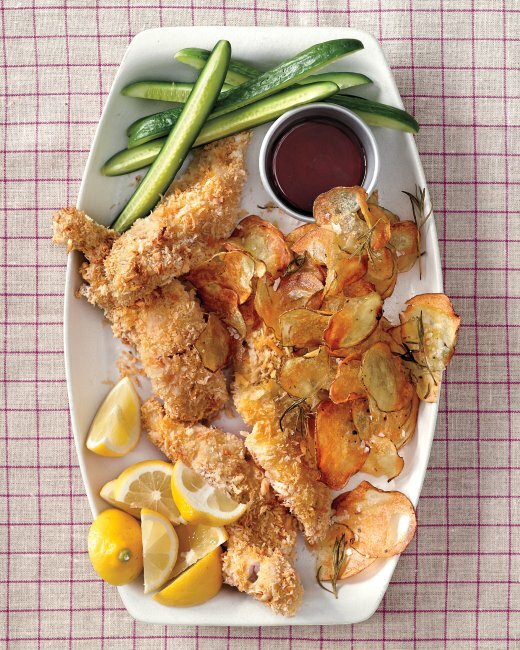 Serve with lemon and cucumber wedges, vinegar, ketchup, and salt.